Mariah, being a Colorado native, has always had an endless sense of adventure and a yearning to constantly be exploring. She grew up in Black Forest, Colorado surrounded by trees and acres of land primed for a child’s sense of adventure. This is where her passion for the outdoors was born, and her imagination let run wild. Growing up, Mariah worked with a local group of youth completing a variety of service projects all around the country, and in Mexico. These consisted of building ramps to make homes accessible to those in wheelchairs, restoring damaged roofs, educating and entertaining youth as we repaired concrete floors in their homes, participating in soup kitchen drives and events, and many other transformative experiences. 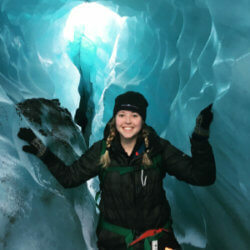 Once graduating high school, Mariah moved to Fort Collins to pursue a Bachelor’s degree in Natural Resource Recreation and Tourism and minor in Business Administration at Colorado State University. Luckily, she graduated May of 2015 with most of her sanity and a wealth of knowledge for “the real world”. The summer after graduation, Mariah worked for the Rocky Mountain Conservancy (the nonprofit partner of Rocky Mountain National Park) conducting youth environmental education programs, adventuring to the top of mountains and high alpine lakes, and learning the ropes of the nonprofit realm. Mariah was first introduced to No Barriers at a job fair at CSU when she connected with the NB representative and discussed the goals and mission of this organization. She immediately felt that this is where she wanted to be. That realization happened several years ago, and she pursued her passion for No Barriers and found herself ecstatic to be selected as the Youth Intern in 2015. Her time at the organization evolved and transformed into a variety of work including social media, expedition management, and marketing. Currently, as the Education Programs Manager, she feels so lucky to be part of an organization that offers such transformative, life-changing experiences year after year.